Not sure what to include in your #FoodBankAdvent box? Here’s what some of the UK Money Bloggers have included so far. The UK Money Bloggers’ #FoodBankAdvent Christmas campaign launched this week and donations are already off to a great start with many bloggers and readers already adding one item a day, for 25 days, to a box destined for their local food bank. The idea is to collect items during November, which can then be delivered to food banks at the start of December, ready for distribution before Christmas. Read more about the campaign and why we think no one should go hungry at Christmas. What should you include in your Food Bank Advent box? 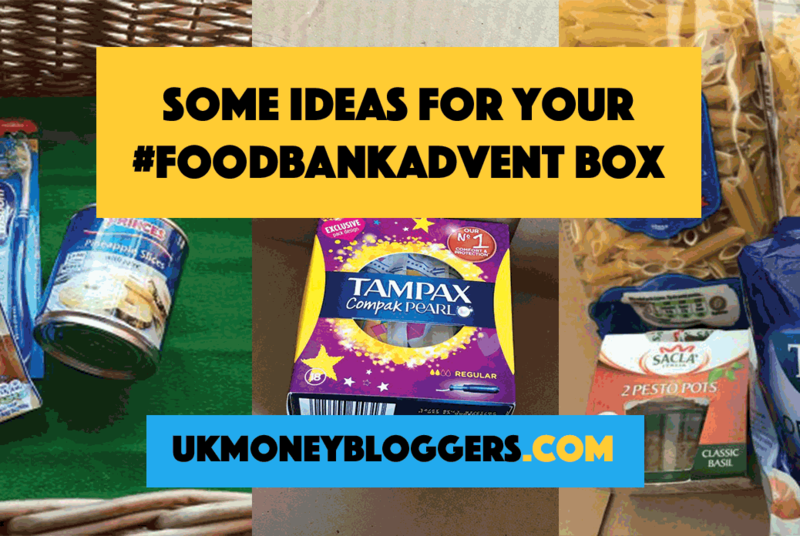 Interested in filling your own #FoodBankAdvent box? Focus on long-lasting, non-perishable tins and packets. The Trussell Trust lists the contents of a typical food parcel here. However, it’s worth contacting the food bank in your area, to find out what they need most. They might have a glut of pasta and baked beans, for example, but really need long life milk. Food banks also give out non-food items like essential toiletries, sanitary protection, laundry products and baby items like nappies and wipes. You can find your local Trussell Trust food bank here, but there are other food banks up and down the country. It doesn’t matter when you start either. Andy from Be Clever With Your Cash began his almost a week after everyone else, starting with a pack of biscuits. Even if you start things off in December you can then donate in the new year. If times are tough and you might need support from a food bank, ask for a referral from a health visitor, doctor, social worker or someone from the council, police, health centres, children’s centres or Citizens Advice.